The Canon EF Lens to Sony E-Mount Camera Speed Booster ULTRA from Metabones improves upon the original Metabones Speed Booster with a 5 element/4 group optical design that incorporates ultra-high refractive index tantalum-based glass for improved sharpness and reduced distortion and vignetting. The Speed Booster ULTRA allows a full frame Canon EF lens to be mounted to an APS-C format E-Mount camera and in doing so, increases the angle of view and the maximum aperture by approximately one f/stop. 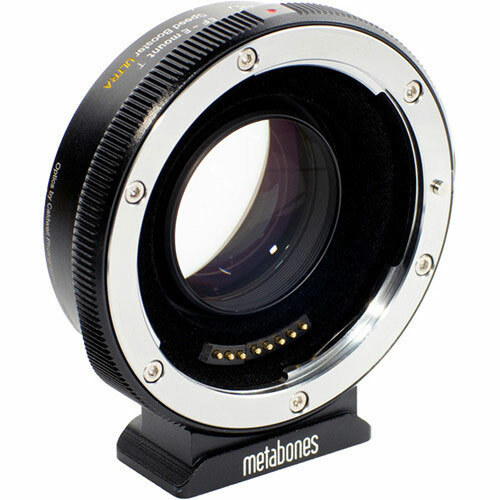 Metabones Canon EF lens to Sony NEX speed booster ULTRA is available for rent or hire from RENTaCAM Sydney.